Jen and Peter Mitten are great supporters of Limbs 4 Kids and have two young children, one of whom happens to have a limb difference. Jen and Peter are parents to Harry, who is two and half years old, and Tobey, who is three months old. Harry is taking to the role of ‘big brother’ with aplomb; has given his baby brother his own special name “Bubba”, is extremely affectionate showering his baby brother with kisses and already encouraging him to play with his precious toy cars. Harry himself is, as his parents describe, “a cheeky, happy, sociable child who is at the wonderful stage in his life where the world is starting to make more sense and is full of wonders and new discoveries”. Jen said that “Harry loves playing with adults and other children, but also enjoys his own quiet time where he can be found exploring colours, playing with his toys and learning about numbers”. Harry also attends crèche and has just started playing ‘Little Kickers’, a weekend introductory soccer program for young children. Harry also has a limb difference; born missing his left forearm below the elbow. But as Jen and Peter said “Harry is Harry first and foremost, his limb difference is just a small part of who our little boy is turning out to be”. “Harry’s personality is such that people often don’t notice his limb difference, as he captures the attention of others by performing tasks and playing in the same way as other two and half year old children do”, said Jen and Peter. Harry’s limb difference was discovered during the 20 week pregnancy scan. “We went in for the ultrasound scan, heard that our baby was developing well until the final part of the scan when we were told that it looked like his left arm was not fully formed”, explained Jen. “This might sound silly, but my immediate response was to ask “so when will that arm start developing” and of course I was told that his arm wouldn’t continue growing and form”, said Jen. “The radiographer was so compassionate and gentle delivering us the news and arranged for us to immediately meet with our Obstetrician”, recalled Peter. Within minutes Jen and Peter were taken to see their Obstetrician, Dr Grant Saffer who was incredibly supportive and “on the ball” explaining to them what the test revealed and what it meant for their baby. “Our Obstetrician immediately arranged for us to meet with Dr Leo Donnan, a Melbourne-based expert in childhood limb difference”, said Peter. After receiving the news Jen and Peter said “we operated in a blur for a little while, and we did share tears but it wasn’t long before our rational ‘we can cope with this’ minds kicked in”. On the day that Jen and Peter learned their child would have a limb difference they started letting family and friends know. “We didn’t want to hide our news, and we have such supportive family and friends we wanted them to be part of the journey we were now starting on”, explained Peter. “Obviously our parents and family members wanted to learn about the diagnosis, but after realising that our baby’s limb difference was something we and our child could cope with, it wasn’t long before my soccer mad family were more concerned with what English team our child would be supporting!”, said Peter. 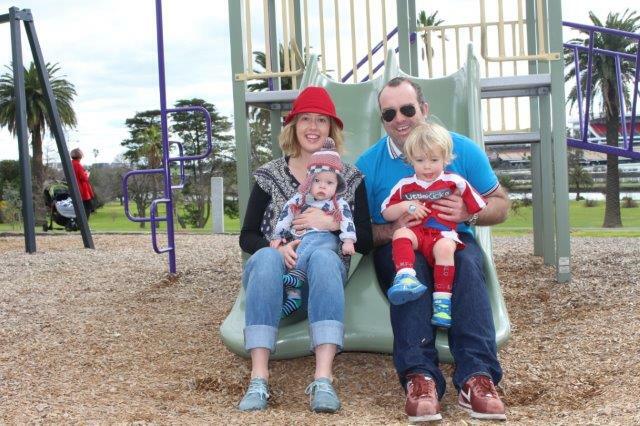 Both Jen and Peter felt that because they had a positive attitude about their baby’s limb difference diagnosis it meant that family and friends felt the same way too. Harry’s birth was an exciting event for Jen and Peter. Peter recounted that “myself and another new father stood side-by-side while our new babies were being weighed and we just looked at each other in amazement about becoming new Dads”. After Harry was born the staff conducted a few more tests to ensure that there wasn’t any additional developmental delays or issues; with none discovered. So, Harry and his new parents headed home a couple of days later. Jen laughingly recalled that “Peter put Harry into the baby-seat with such trepidation, drove home at 20kms under the normal speed and drove over any bumps at a walking pace”. Harry doesn’t attend any specialist appointments at this stage, but will likely begin attending some as he gets older. Jen and Peter said that “as Harry gets older we will explore the need for occupational therapy or other supports, but at the moment it isn’t required”. Similarly, Harry doesn’t use any prostheses or other assistive devices at present and his parents have decided that they will look into in the future in conjunction with an older Harry. What has amazed Jen and Peter most is what Harry is able to do, despite missing his left forearm. “Harry’s dexterity in his right hand is extraordinary and he has developed high fine motor skills; in fact we call it his ‘super hand’”, Jen marvelled. To date, by and large, the responses from community members about Harry’s limb difference has been very positive. Jen said that “some people don’t notice that Harry has a missing forearm whereas others, both adults and children, are curious and will ask about his limb difference”. Indeed, Jen and Peter prefer that people ask questions as they are happy to explain Harry’s limb difference to others “because it’s a way of normalising it and educating people”. Jen recounted one situation where a parent stopped her in the supermarket asking whether it would be OK to enquire about Harry’s missing hand as this other parent’s child had noticed and was curious. “I was really pleased that she did so as I was able to talk to both her and her child, after which her child wandered off with a better understanding and back to the important role of choosing the fruit he wanted”, related Jen. “I certainly prefer it when people ask questions on behalf of their children rather than “shushing” them and telling them to look away”, said Jen. The only negative experience was encountered in a local playground where a group of older children followed Harry while he played; pointing and staring at him. Jen felt that the children, “who were old enough to know better”, were being rude and inappropriate so she took the opportunity to let them ask questions and remind them “it’s rude to point and stare at anyone”. Their questions sated, the group of children wandered off and took their attention away from Harry. Both Jen and Peter have found facebook, blogs and other resources to be extremely beneficial. “The Limbs 4 Kids facebook group and other pages have been fantastic as, when you have a child with a limb difference, you can feel like you’re the only one and social media helps you to realise that there is a whole community of families experiencing the same things,” said Jen. In terms of blogs, Jen and Peter can recommend ‘One Little Fin’ and ‘Living One-handed’ to be good for learning about limb difference and reading the stories of children and families. Indeed Jen and Peter are looking forward to receiving their copy of Ryan Haack’s new book ‘Different is Awesome’ and plan on giving a copy of the book to their local library also. Peter, who describes himself as “sports mad”, also recommends Jim Abbott’s inspiring and informative autobiography, ‘Imperfect – An improbable life’. As Peter recounted, “Jim went on to play baseball with the famous Yankees team and win an Olympic medal, despite having a missing hand”. Both Jen and Peter believe that everyday individuals and well-known persons with limb difference can act as role models and help families to see a positive future for their child; something that they feel social media and other resources facilitates well. Jen and Peter want to thank their families, their friends and all the others who have supported them since Harry, and now Tobey, have come into their lives. Jen and Peter also want to thank the Limbs 4 Life community of families for being so welcoming, open and willing to share their own experiences of bringing up children with limb differences. Limbs 4 Life would like to thank Jen and Peter for sharing their story and for being great advocates of the Limbs 4 Kids program. In addition, Limbs 4 Life would like to thank Peter’s mum Mary and her colleagues at fellahamilton for fundraising and raising hundreds of dollars for the organisation earlier this year.